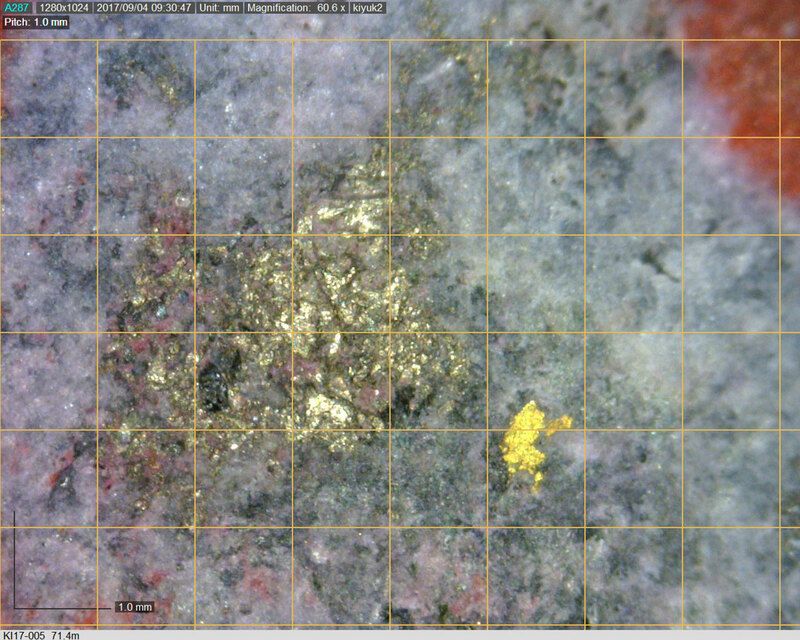 The Kiyuk Lake Gold Property is located in Nunavut, 50km north of the border with Manitoba and 350km west of Arviat. Access is by air to an ice runway in winter or by float plane in summer. 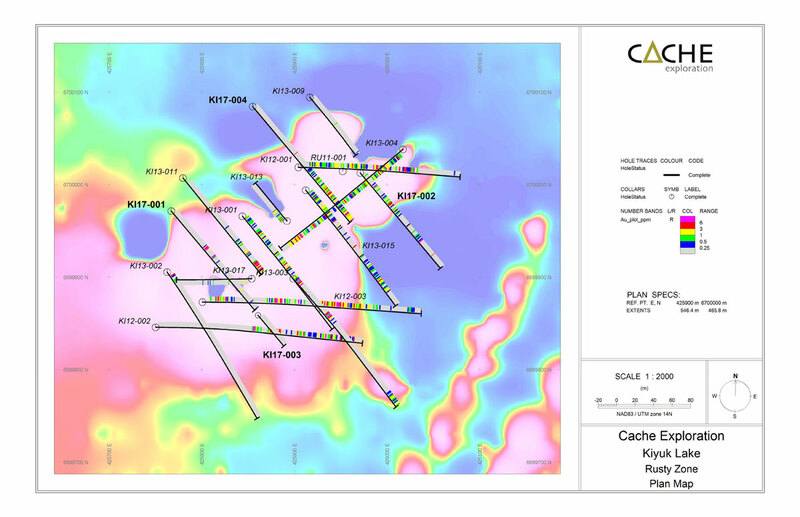 The property consists of 70 mineral claims aggregating 590 sq km. 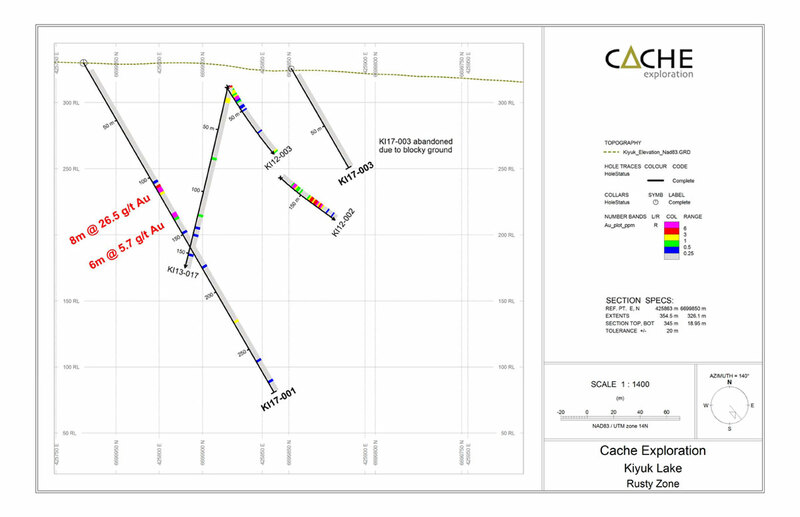 Cache has the right to earn 100% interest in the Property subject to a 2% NSR. 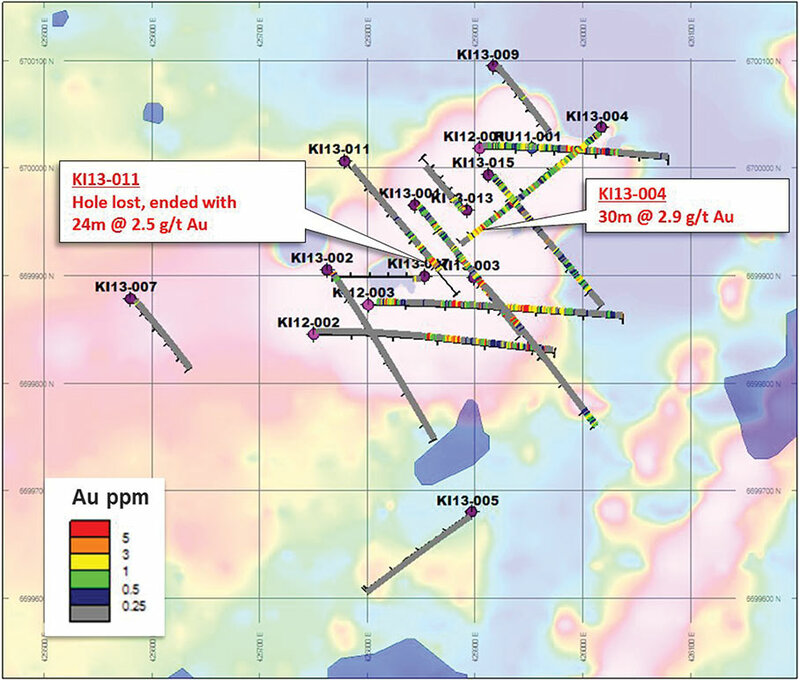 Kiyuk hosts a number of intrusion related gold occurrences which are characterized by intense sodic and calcic metasomatism. 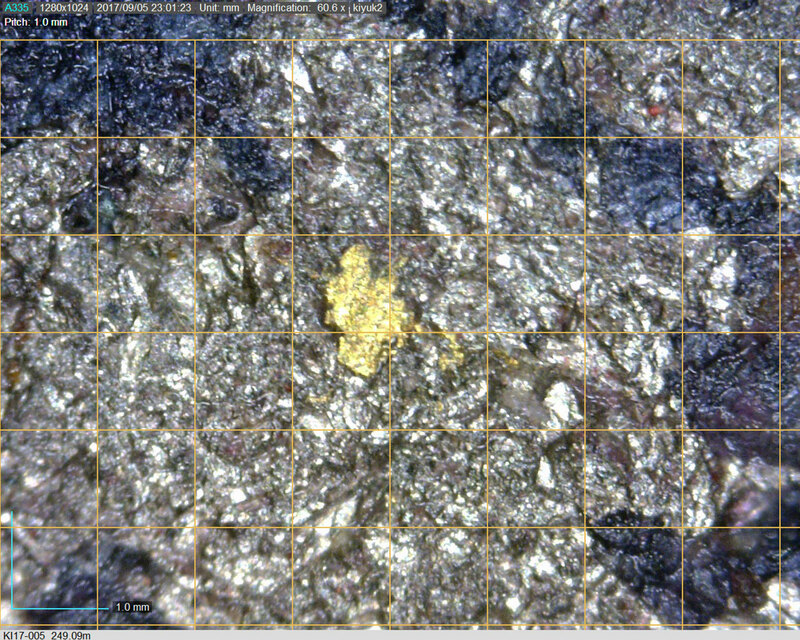 Gold is associated with pyrrhotite, pyrite and magnetite. 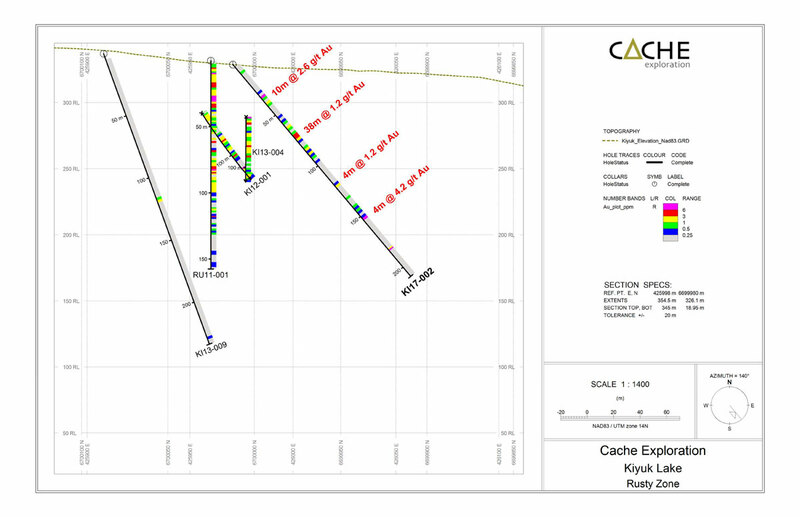 Best drill results to date include 38m at 4.2 g/t Au from surface and 36m at 4.95 g/t Au from 134m using a 0.5 g/t Au cut-off. 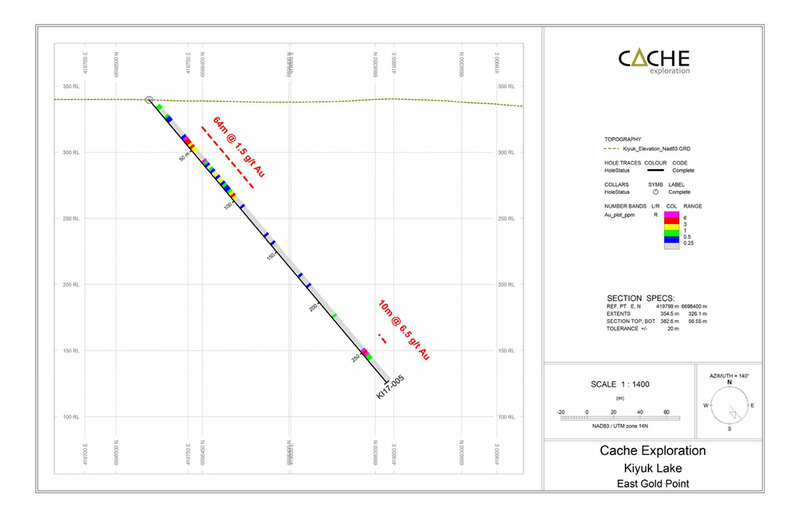 A recent hole returned 250m at 1.6 g/t Au from 8.2m using no cut-off. A comprehensive digital database exists for the property. Further drilling is required. 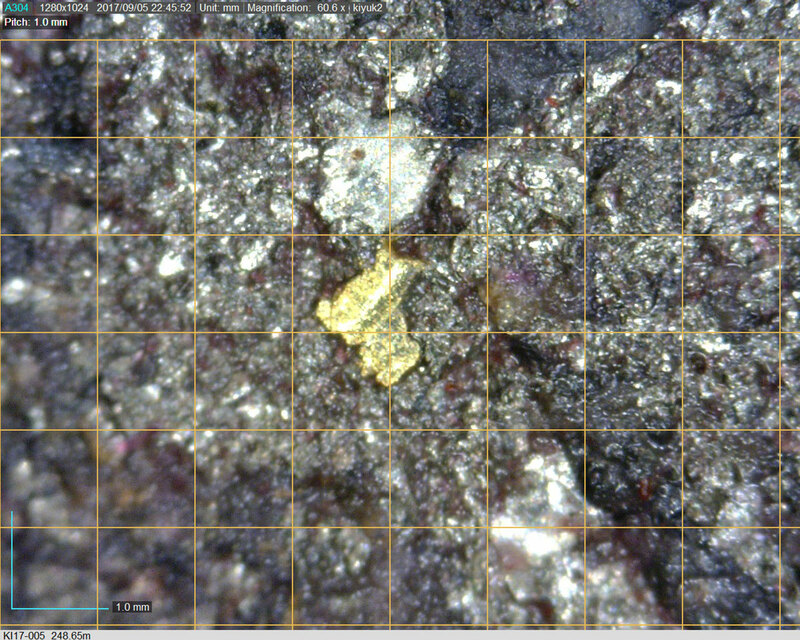 Gold mineralization is hosted in Proterozoic sedimentary rocks of the 2.45 to 1.82Ga Hurwitz and Kiyuk groups which unconformably overlie Archean basement. The continental to shallow marine siliciclastic, carbonates and rare volcanic rocks that make up this succession are thought to represent an intracratonic basin (Aspler et al. 2002). At Kiyuk Lake, the predominantly sedimentary succession represents a structural ‘basin’ that formed as a result of infolding of Proterozoic and Archean rocks during the Trans Hudson Orogen (1.9-1.76 Ga). Faulting and folding of the rocks on the Property are also thought to be related to this event. Proterozoic magmatism in the region occurred in two pulses: 1)monzogranites of the Hudson Suite emplaced within the upper crust and associated rhyolite erupted on surface from 1765 to 1750ma (van Breeman et al., 2005). 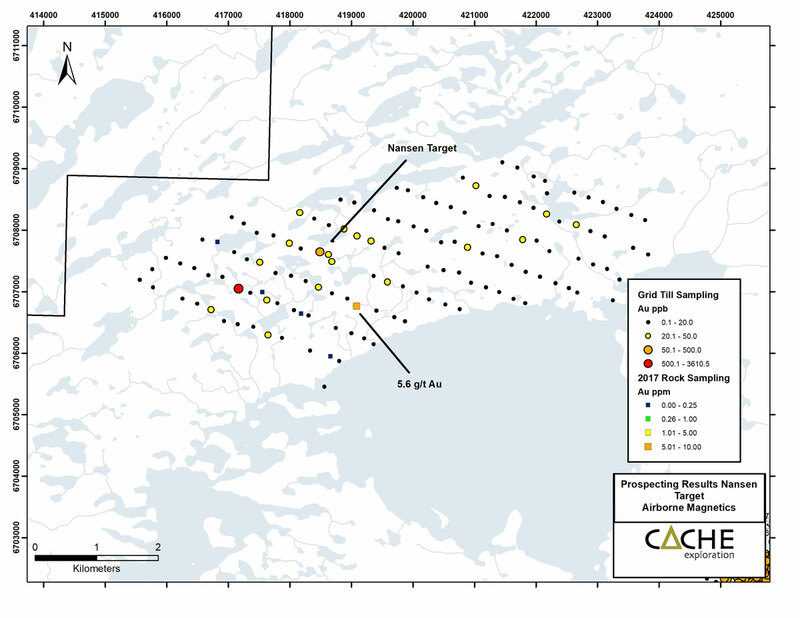 It is postulated that this later magmatic event was the driving process responsible for gold mineralization, although the timing of alteration and gold mineralization has not been constrained. 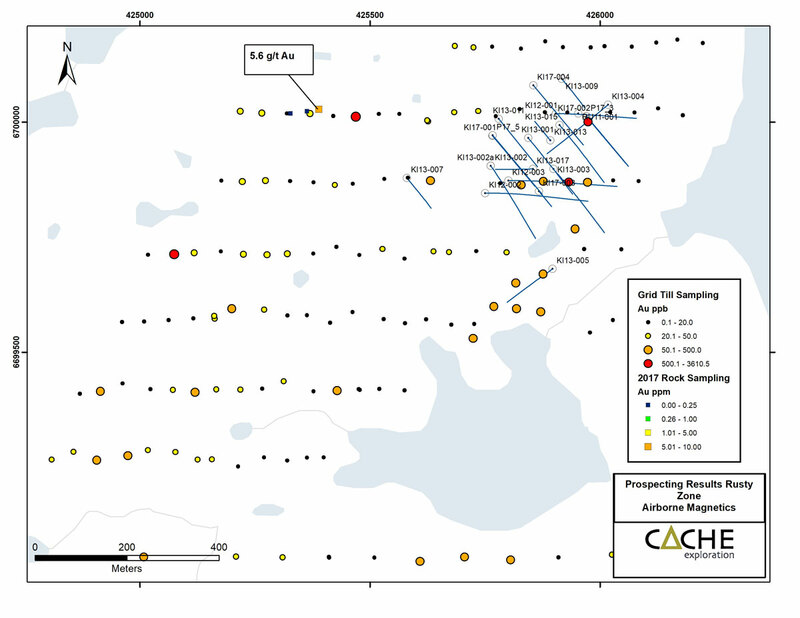 Gold mineralization at Kiyuk Lake is most similar to reduced intrusion related gold (RIRG) or iron-oxide-copper-gold (IOCG) deposit models. Mineralization is associated with pyrrhotite, pyrite, arsenopyrite, and magnetite (+/- hematite). The mineralizing event is accompanied by sodic and calcic alteration which occurs as veins and breccia of albite-carbonate-actinolite-quartz ± scapolite ± tourmaline. In areas of intense alteration the host rock is bleached and lack primary textures. Au element associations include As, Bi, Te, W, Ag, Co, Ni and sporadically U. There is a lack of widespread quartz veining or silicification. At Rusty most of the mineralization is hosted by breccia with albite, carbonate actinolite and pyrrhotite as shown here. Gold was first discovered in 1991 by prospectors working for Comaplex Minerals which was following up anomalous arsenic in lake sediment samples from a survey conducted by the Geological Survey of Canada in 1976. 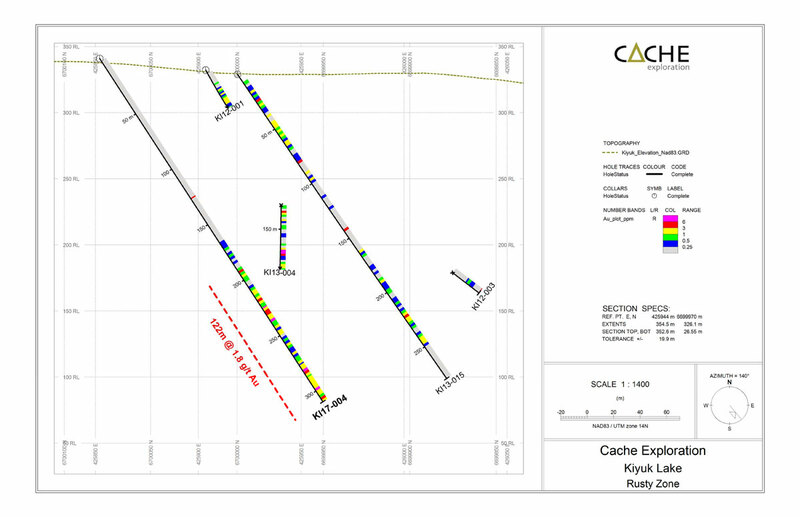 They found multiple occurrences of gold bearing boulders assaying up to 36.97 g/t Au. The first drilling campaign was completed by Newmont in 2008 and included 14 diamond drill holes totalling 2331.4m. 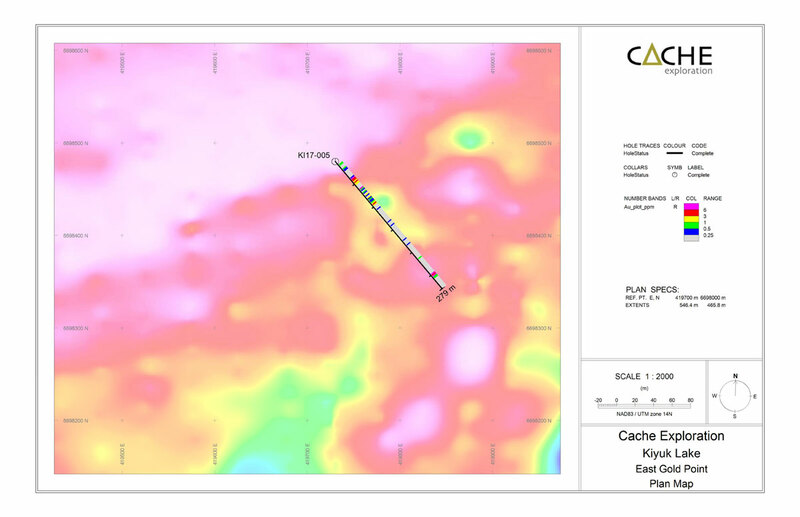 Evolving Gold and more recently Prosperity Goldfields Corp. have conducted three successive core drill programs, the most recent ending in April 2013. Since Newmont, 46 core holes for 9523 m have been completed at seven different showings. 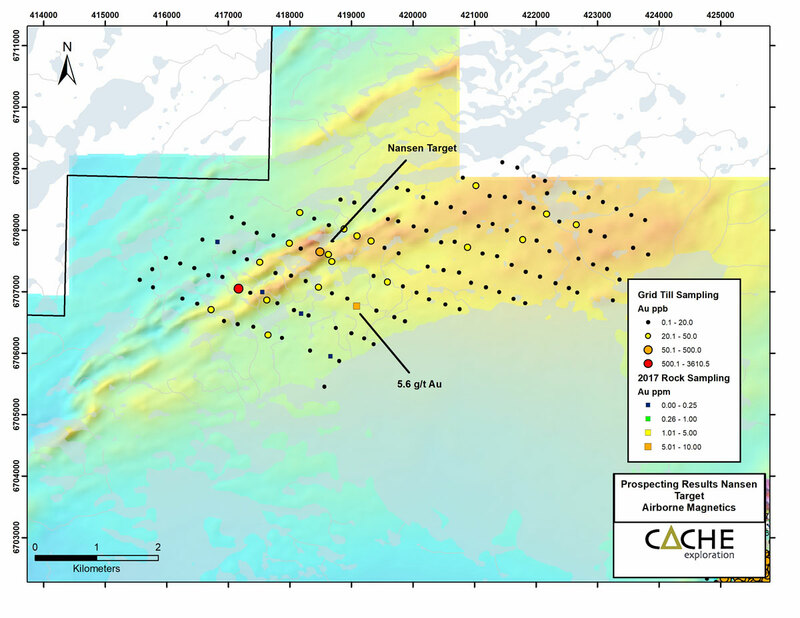 The Rusty target is the most promising zone of mineralization discovered to date. 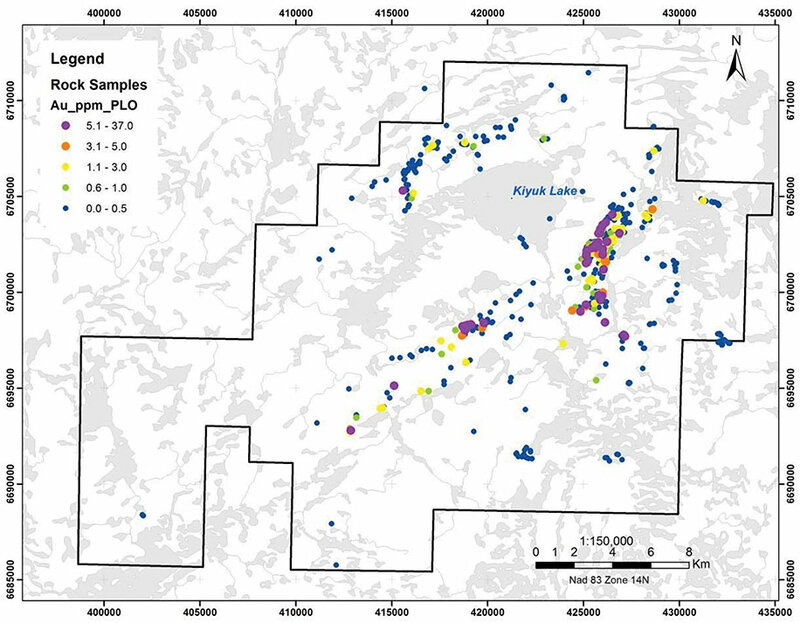 In addition to prospecting and mapping, airborne magnetics and regional and grid till sampling have been completed on the property. 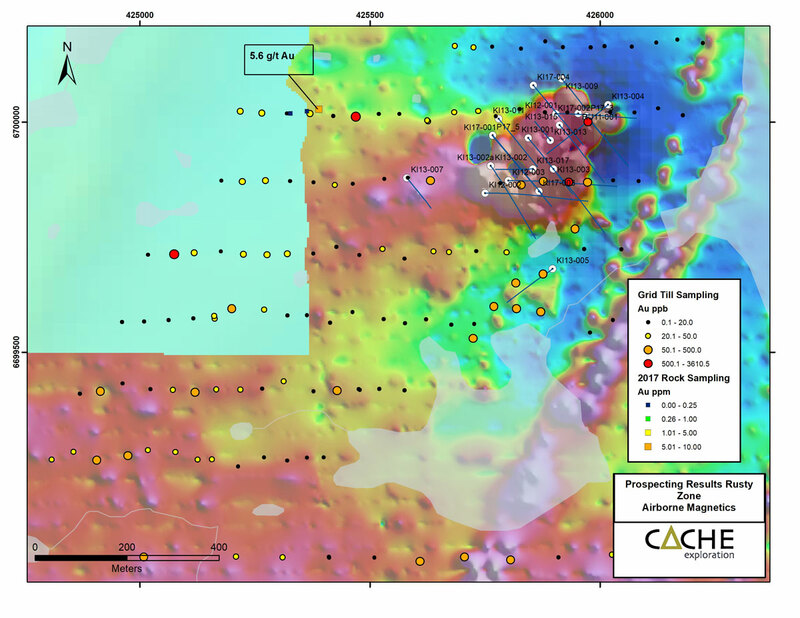 Ground magnetics has also been completed over select areas to better define drill targets.